← What a wonderful weekend! As many of you know, we will be working with a Chilean national when we arrive in Arica. He is already there ministering among the Aymara in the isolated villages and has been for about 10 years now. This is Marcelos car. Were so thankful that hes OK. 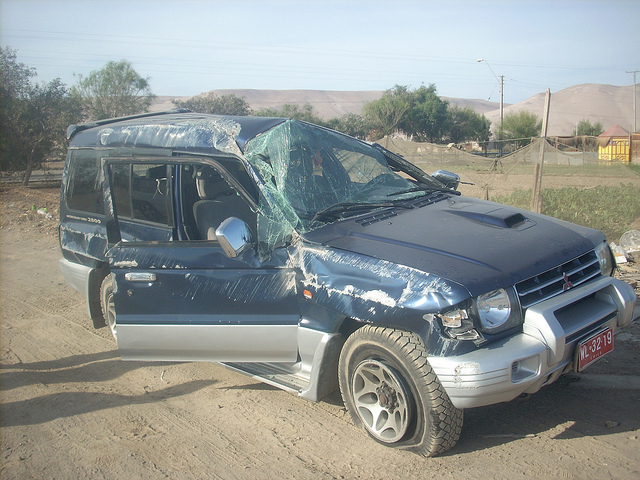 This past Thursday at 6:00pm he was returning to Arica when he had a blowout which caused his car to roll three times. He and all his passengers are ok with only minor injuries, praise be to God. Sadly, though, his car was totalled. A 4X4 is necessary to reach the rural Aymara. So please pray for Marcelo as he recovers from the shock of his accident, but also pray that God will provide a way for him to get a new car to continue his needed ministry. Wow. With that severe of an accident and no serious injuries – just amazing! I will pray that he will be able to continue with his ministry. Dear me! How scary! I will be praying for him and that He will see God’s goodness through this.